Either if you are purchasing a new license, extending the validity of your exising license, requesting a trial license, or recovering a lost license, once you complete your order, you will be presented with a web page containing the text code of your license, and also a link to download the license file itself. Copy the license's text code from the text box in that page and use it to activate by text. Press the Download license button and use the downloaded file to activate by file. 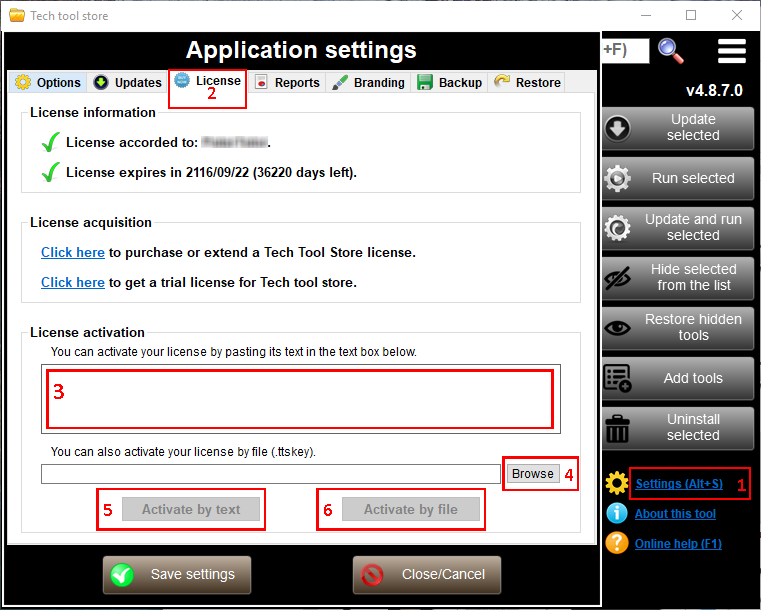 Activate by copying the license file to the Tech Tool Store's directory. Scroll down in this page for more instructions. Numbers between parentheses refer to markings in the picture below. Launch Tech Tool Store, press Settings (Alt+S),	in the lower right pane (1), and then select the License tab (2). Paste the text of your license in the text box, under the License activation group (3). Press the Activate by text (5) button to activate your license. Launch Tech Tool Store, press Settings (Alt+S), in the lower right pane (1), and then select the License tab (2). Press the Browse button (4), locate and select the license file you just downloaded. Press the Activate by file button (6) to activate your license. Copy the downloaded license file (TTSlicense.ttskey) to the same directory where you have the TechToolStore executable file. Launch Tech Tool Store. Your license is automatically activated.